Peroxicap is a 5 in 1 multi purpose hydrogen peroxide activated and encapsulating polymer fortified carpet cleaning agent. It combines a synergistic hydrogen peroxide detergent blend with a special encapsulating polymer. The special peroxide blend oxygenates and activates the cleaning power of the polymers and surfactants, and also helps effectively remove many spills and spots (coffee, wine, blood, urine caused discoloration, and more) during the cleaning process. The encapsulating polymer bonds to, surrounds, and encapsulates soil. This encapsulated residue that is left in the carpet following cleaning can be extracted from the carpet during the post-cleaning and/or vacuuming process. 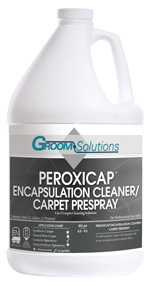 The encapsulating polymers in Peroxicap also assists the carpet after cleaning at fighting against re-soiling. Carpets cleaned with encapsulating polymers have been demonstrated to stay cleaner longer than when traditional cleaning solutions are used. Peroxicap can be used effectively as a hot water extraction prespray, a low moisture encapsulation cleaner, a bonnet cleaning solution, an encapsulating hot water extraction rinse, and as a carpet spotting agent. Due to the fact that much of its cleaning effectiveness is created by the peroxide activation and encapsulating polymers, Peroxicap does not need to use harsh solvents and high pH phosphates, making it safe and effective to use on all synthetic carpets as well as wool carpets. Always pretest surface being cleaned for colorfastness with solution before proceeding. the carpet thoroughly with a counter-rotating cylindrical brush machine, a shampoo brush, a triple-planetary rotary brush machine, or an orbital or oscillating pad machine. Allow the cleaning solution to dry completely. Vacuum the carpet at the next scheduled vacuuming interval. pad. Allow the cleaning solution to dry completely. Vacuum the carpet at the next scheduled vacuuming interval. Brush. Extract the carpet and applied prespray solution with a compatible extraction rinse solution. Mix one part chemical solution with 12 parts water (10 ounces to a gallon) in a trigger, pump up pressure, electric, or battery sprayer. Apply the solution evenly across the fiber. Agitate and brush the fabric gently with a (hand bonnet mitt or horse hair brush or equivalent SOFT bristled brush). For low moisture cleaning, simply allow the solution to dry and vacuum off. Forextraction cleaning, extract with fresh water rinse.